Sometimes you just want to write because it allows you to talk about it. You are not judged. The annual anthology from Seashore Family Literacy is fresh from the press. This year the book features work from all the Seashore writers — 40 students/volunteers/mentors, from ages 9 to 75. 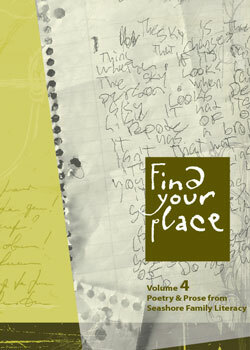 The fourth volume of Find Your Place reflects our growing programs. We started with a teen writing group, and in the last few years have expanded to include grade school and middle school writing groups, along with summer writing camps. We recently added a writing group for adults, too. I get a bit tender at this time of year, a mixture of exhaustion and achievement. Is this what parents feel? A bittersweet blend of "Thank God this year is over!" and "My God, they are growing up fast!" Rather than jubilant, I feel a bit wrung-out. Rather than accomplished, I'm writing a mental list of all the things I should have done, shared, been. I fear I'm falling short of giving students what they need. Last night I pried for feedback. Why do you come to writers group? I asked the teens and volunteers. What do you like best? What needs work? In a haze of end-of-year fatigue, the unspoken question was Does this matter? This morning I read the student comments, and felt the gentle tug of Yes. Writing is about finding who you are, about getting the words on paper before your brain bursts from an overload of stories.This is an escape place for me. Writing is like therapy on paper. I have learned a lot. It feels amazing being in a book!